Stream Watchers frequently monitor their adopted stream or section of the Patapsco River, picking up litter while others venture out to haul junk from other areas throughout the Patapsco River valley to the nearest road on their own time. This album documents the individual and small group contributions for 2015 (because we are environmental activities end in November, we began this one with December photos submitted). This is necessary to document for weight totals for the year, since these events are often not tallied and reported in the same manner as group cleanup events. If you have cleaned up an area on your own and have a photo you'd like to share, please let us know. Special thanks to our super stream watcher, Jon Merryman, our main junk hauler and over 100 individuals, couples and families who are watching our streams and lower Patapsco River! 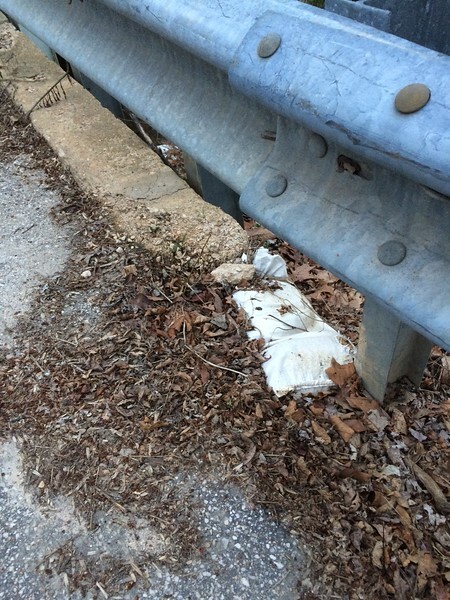 4/13/2015, Jon Merryman, Deep Run, Howard County, At the bridge over Deep Run on Furnace Avenue in Elkridge, who ever picked up the road closed sign several weeks ago dumped the sand bags (4) behind the guardrail next to the creek. Pic 1 of 2 in same area. Estimated weight 100 pounds.